As part of Jusino Insurance Services’ commitment to acting agents of change in their community, a new charity campaign has been announced to support the children of Chicago. Understanding the challenges these children face every day, Jusino Insurance is vested in raising awareness and funds to enrich their lives through the educational and cultural programs offered by Casa Juan Diego. It’s truly heart-warming to see the commitment Casa Juan Diego has toward providing enrichment for our most valuable resource – our children. Raising funds to help...strengthen our community through our kids is a cause that should inspire us all. Jusino Insurance Services reveals another noteworthy charity campaign as part of its ongoing community involvement program. The agency, serving families from two locations in Chicago, IL, hopes to rally the community behind Casa Juan Diego and their efforts to provide positive, enriching activities for the youth of Chicago. Readers who would like to join their campaign may do so now through the designated donations page at https://www.crowdrise.com/helpusgiveouryouthth. Casa Juan Diego (CJD) was formed in 1996 by parents who were concerned their children weren’t getting the guidance and support they needed to survive and thrive in the sometimes violent neighborhoods of Chicago. Since then, hundreds of young people have received academic support, moral guidance, leadership skills and cultural grounding from CJD’s dedicated, bilingual mentors with roots in the Latino community. Focusing heavily on literacy, they also provide recreational activities, preserve tradition and encourage creativity. The ultimate goal is to give kids from ages 6 to18 a positive environment filled with the services and support they need to grow into adulthood as well-educated, confident, productive and responsible members of the community. To help achieve their goal of $500, the agency’s own large network of customers, business partners, friends, staff and family are being encouraged to actively participate not only contributing themselves, but also by helping spread the word about the campaign for CJD and Chicago’s youth through their own circles of influence. The team at Jusino Insurance is also hard at work promoting the initiative through the agency’s social media channels, email and text message communications, as well as through their monthly magazine, delivered to thousands of households in the greater Chicago area. In fact, Our Hometown magazine reserves a full page to feature this worthy cause, even acknowledging all of those who donate a minimum of $5 through the donations page at https://www.crowdrise.com/helpusgiveouryouthth. The electronic Flipbook version of the current issue may be accessed here: http://www.jusinoinsuranceservices.com/Our-Hometown-Magazine_41. Fully committed to their community involvement program, Jusino Insurance Services will continue to work with individuals and nonprofits in the area to identify new opportunities to support the community every 30-90 days. Interested parties are also invited to submit information on local families, persons or groups who would benefit from a helping hand at http://www.jusinoinsuranceservices.com/Add-Community-Cause_48. Entries are given careful consideration, and the selected worthy causes contacted by a representative of the agency’s Community Program. More information regarding past and current campaigns supported by Jusino Insurance Services may be found at http://www.jusinoinsuranceservices.com/community-cause. 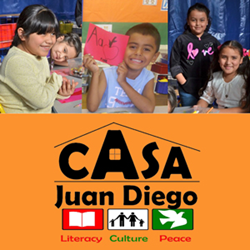 To learn more about Casa Juan Diego, visit http://www.casajuandiego.org/. A full service firm dedicated to helping families from two Chicago locations, Jusino Insurance Services’ mission is to provide the best insurance and financial services in the industry, while providing superior service. Lisa Jusino and her team of caring professionals believe their most important job is to protect the things which are most important to their customers (their families, homes, cars, and more), and to help them develop strategies for long-term financial success. To reach the capable agents at Jusino Insurance, please call 312-850-0775. More information on the products and services they offer may be found at http://www.jusinoinsuranceservices.com/.